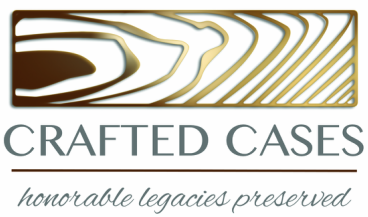 Hi, I am Mike Outten, owner of Crafted Cases. Crafted Cases, a North Carolina veteran-owned small business, delivers exceptional value to customers with its line of hand-crafted flag and memorabilia flag display cases. Choice, quality, and customization allow me to construct the right case for you. It is what sets me apart from others. I offer three different flag case sizes and several memorabilia case designs. You have the option of three wood types and five stain colors. In addition, you can choose from eight crushed velvet colors for the memorabilia case backing material. My products are ideal for those retiring from a state or federal career, to honor one's service to his/her community and country (police, fire department, military), and to preserve the memory of a loved one you admired and cared for. My cases are handmade and I do not carry a large off-the-shelf inventory. I build custom cases for individual tastes. I invite you to walk through my "cyber" store and view the products. Select a case and preserve a legacy for the future. You can count on me to put the effort and craftsmanship you expect in constructing your case. Welcome, and enjoy your shopping experience! Be sure to like this site on Facebook and to share it with friends (just click the button above). I do have a passion for woodworking and donate 10 percent of my revenue each month to select charities.